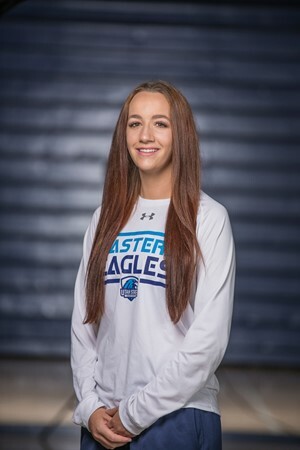 Jordan Scoggins is the women’s basketball manager for USU Eastern. She is from Helper, Utah and has lived there her whole life. She is a graduate of Carbon High. At Carbon High School, Scoggins was involved in multiple activities. She competed in basketball four years, volleyball four years and track her last three years. Scoggins began her basketball career in second grade, where she developed a love for the game. During jr. high, Scoggins participated in FCCLA, played the flute for the band and was a cheerleader. She would go to her older brother’s football games during that time and admire the drill team dancers performing at half times. Scoggins wanted to be a member of the drill team until she was told she had to choose between drill and basketball. At that point, it was no question, her love of basketball won over. Through her high school years, Scoggins worked hard at her basketball skills and dreamed of playing basketball at the collegiate level. Her future was looking bright. She was voted region 12 MVP and first-team all state. Scoggins also took third place at state in javelin for Carbon’s track team. Half way through her senior year, Scoggins went through one of the hardest experiences of her life. During a game, she made a move to beat her defender and fell to the floor in pain. She had torn her ACL. She was out for the rest of her senior year. Scoggins was devastated about her injury. She felt lost and didn’t know what to do. She was stuck. She couldn’t change things anymore. There was no more “next practice” or “next game” to make up for previous mistakes. Scoggins injury changed her perspective of life. She aspires to never take things for granted. Scoggins learned that it is important to enjoy the things she can do now, so later when she can’t, she won’t have regrets. Despite her tragedy, Jordan still played basketball at USU Eastern. It was tough for her to learn how to play after a grueling injury. She was frustrated because she couldn’t easily do things that used to be simple. It was hard for her to change directions on her bad knee. In her head she could easily change directions, but her body wouldn’t follow. Scoggins realized that there was no easy way around her challenge and that she would just have to go straight through it. She quickly became determined and set her mind to just do it. Through her injury, Scoggins learned that life does get better even though at the time of tragedy, it feels like the end of the world. She is better able to understand people because of it. This came in handy when she became the team manager for the Lady Eagles. Scoggins knows first hand the struggles basketball players go through. She helps individuals on the team know what they can improve on. Her famous statement, “Step into my office,” came about during a tournament early this year when multiple players were facing adversity. She took time with each player to give tips and offer advice. The most satisfying part of her day is being able to encourage athletes. If she could live anywhere she wanted, Scoggins would live in Slovenia because it is beautiful and her grandma’s family is from there. If she could have any talent, she wishes she could sing or be creative because it would last for the rest of her life, unlike being athletic. In 10 years, Scoggins hopes to have a decent job and be enjoying life no matter the circumstances. She loves to read all kinds of books. Scoggins has a black labrador puppy named “Charley” she brings on campus. She welcomes all who aren’t shy to stop and say “hi” to her and her dog.